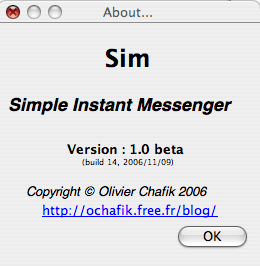 That’s it, it’s official, Sim reached the beta stage. As you may have noticed, I got rid of the system’s window decorations (the title and the borders), and I had to write my own (so that it is still possible to resize the window and to minimize it). This allowed me to shrink the contact list window by a good deal. Now it is also possible to move the window from whichever point you wish : just click on it and drag your mouse, the window will follow (no need to point precisely to the title). The small gem minimizes the window whereas the bigger one triggers a menu with settings and a “Quit” command. Thank you, early Sim users / alpha-testers, for all the feedback that made this beta release possible.